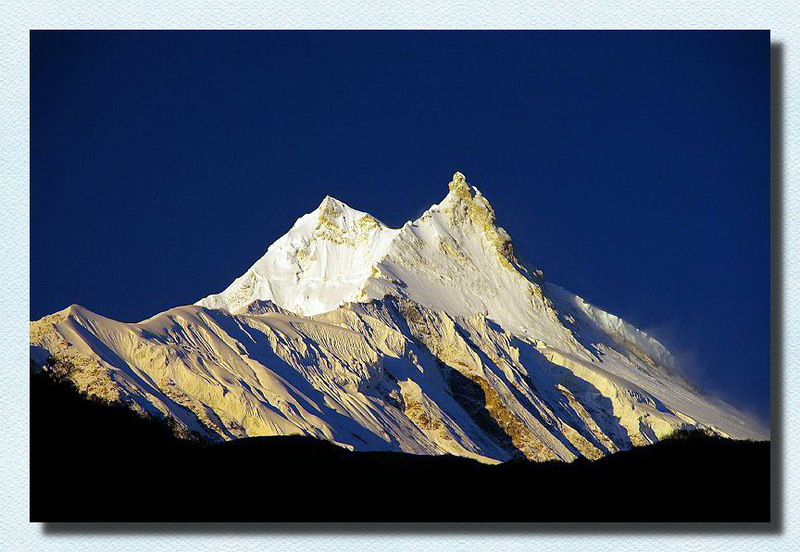 Manaslu also known as Kutang is the high peak of the Gorkha massif, and is the eighth highest mountain in the world and best climbing mountain. It is located in the Mansiri Himal, part of the Nepalese Himalayas, in the west-central part of Nepal. Its name means "Mountain of the Spirit"
Manaslu was first climbed on May 9, 1956 by Toshio Imanishi and Gyalzen Norbu, members of a Japanese expedition. It is said that "just as the British consider Everest their mountain, Manaslu has always been a Japanese mountain". Manaslu at 8,156 metres (26,759 ft) above mean sea level (m.s.l) is the highest peak in the Lamjung District and is located about forty miles east of Annapurna. The mountain's long ridges and valley glaciers offer feasible approaches from all directions, and culminate in a peak that towers steeply above its surrounding landscape, and is a dominant feature when viewed from afar. The Manaslu region offers a variety of trekking options. The popular Manaslu trekking route of 177 kilometres (110 mi), skirts the Manaslu massif over the pass down to Annapurna. The Nepalese Government only permitted trekking of this circuit in 1991. The trekking trail follows an ancient salt-trading route along the Budhi Gandaki river. Enroute, 10 peaks over 6,500 metres (21,300 ft) are visible, including a few over 7,000 metres (23,000 ft). The highest point reached along the trek route is the Larkya La at an elevation of 5,235 metres (17,175 ft). As of May 2008, the mountain has been climbed 297 times with 53 fatalities.